Admit it, you’re not over them either. These games were small but fun, and included most of the things you’d expect. Piping. 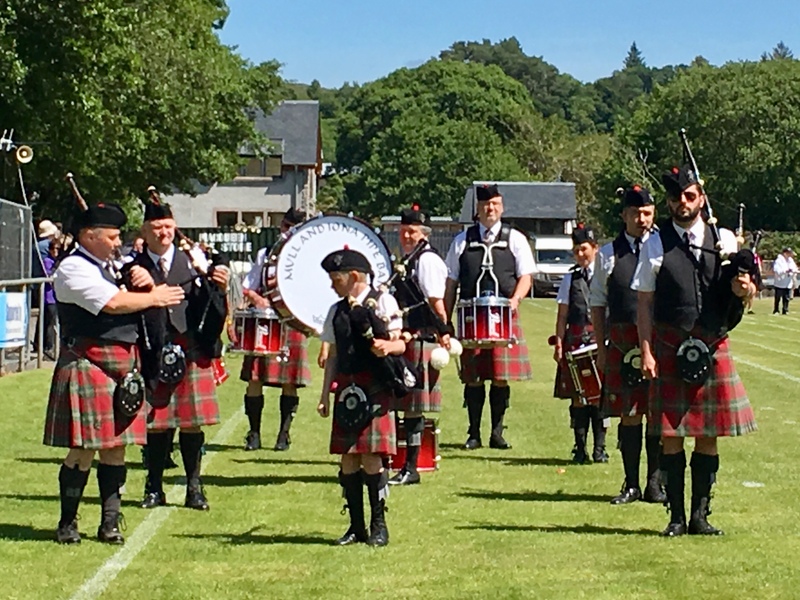 This is the Mull and Iona Pipe Band. Scotland the Brave! Of course. It’s cool to watch kilted men and women make the hammers fly! Unfortunately, we had to leave to catch our train to Glasgow before the caber toss. I’m guessing caber toss comes last because it’s like a finale, and also because it must really tear up the field! This just means I need to go back to Scotland for more games. I did come home with an awesome souvenir, though. It even involves wool! This is my new knitting bag. It’s certified Harris Tweed. What does that mean? The wool has to be sourced in the UK, and it’s spun and woven on the Isles of Harris or Lewis in the Outer Hebrides. The fabric has to be woven in a crofter’s home, on a human-powered loom (not electric). 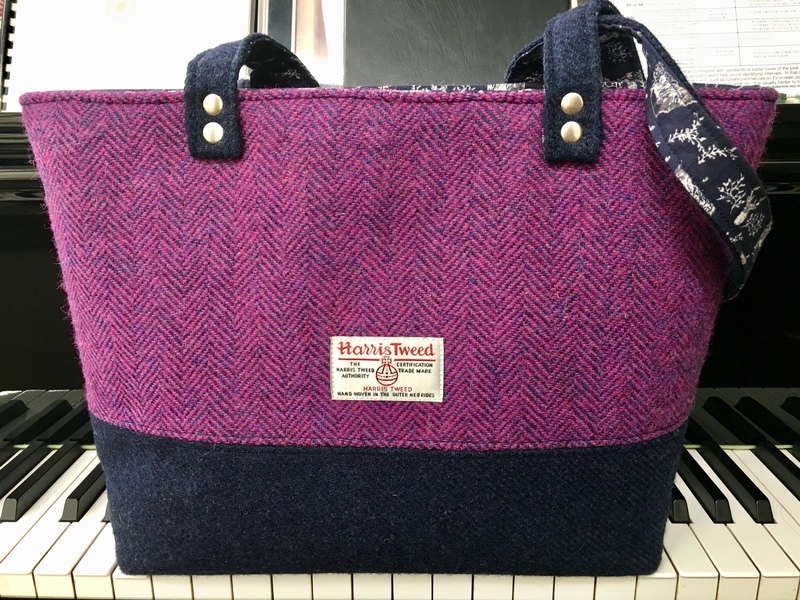 Some weavers weave for Harris Tweed, and some are independent weavers designing their own cloth that will be certified as Harris Tweed, but not sold by Harris Tweed. The woven fabric goes back to the mill for washing/finishing (*see below for historical sidenote) and inspection. Independent crafters can purchase this fabric for their designs. This bag is made by Shona of Thistle Fairy Designs. 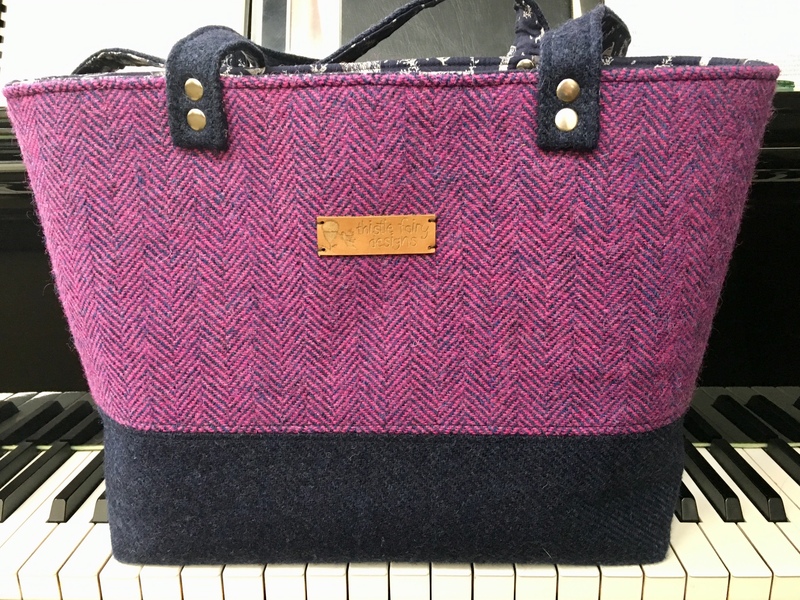 I love the colors of this tweed; it’s so vibrantly pinky purple! 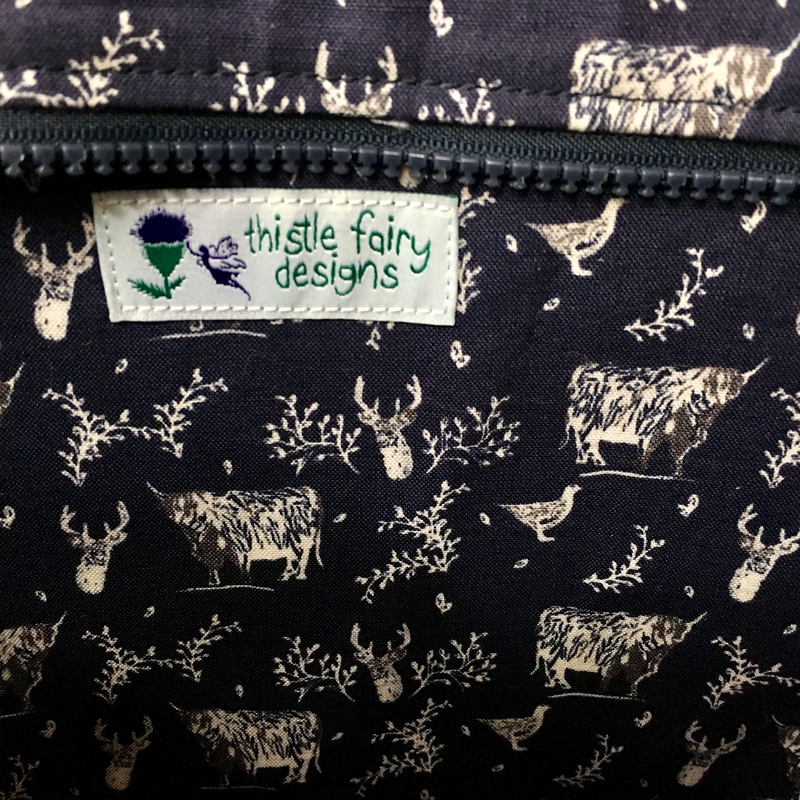 The fabric lining features Highland cattle (hairy coos! ), stags, heather, and pheasants? grouse? All very Scottish. It was a pleasure meeting Shona and talking to her about Harris Tweed. Her work is exquisite. I love my new bag! *Woolen fabric used to be finished by hand, and this was called waulking the wool. It involved stale urine(! ), rhythmic beating, and usually singing to pass the time. More info here (this is the singing group I wanted to see at Auchindrain on our Oban weekend, but it was too far and we didn’t have a car). Nowadays this finishing is done by machine at the mill, using ammonia rather than urine. Thank goodness. Now I’m home, catching up, trying to decide if I like my current design project enough to continue with it. So far, it’s not blowing my kilt up. No pictures! I’m also trying to perfect that no-hump crescent shape I mentioned earlier, so I can make a tutorial, as requested. 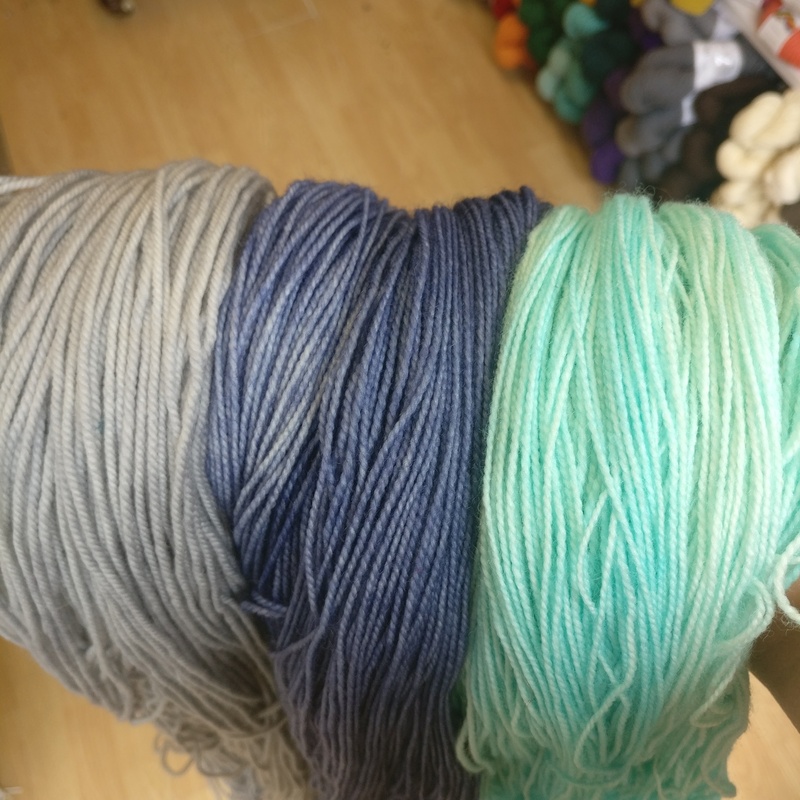 And I’m dreaming of more Sheepish Sock yarn from Ginger Twist Studio in Edinburgh. I have the blue in the center, Pappy’s Garden. I wrote to Jess to see if I could get a coordinating color so I could design a shawl. She suggested either Dove on the left, or Breakfast with Ginger on the right. What do you think? So far Dove is trending on Instagram and Facebook! 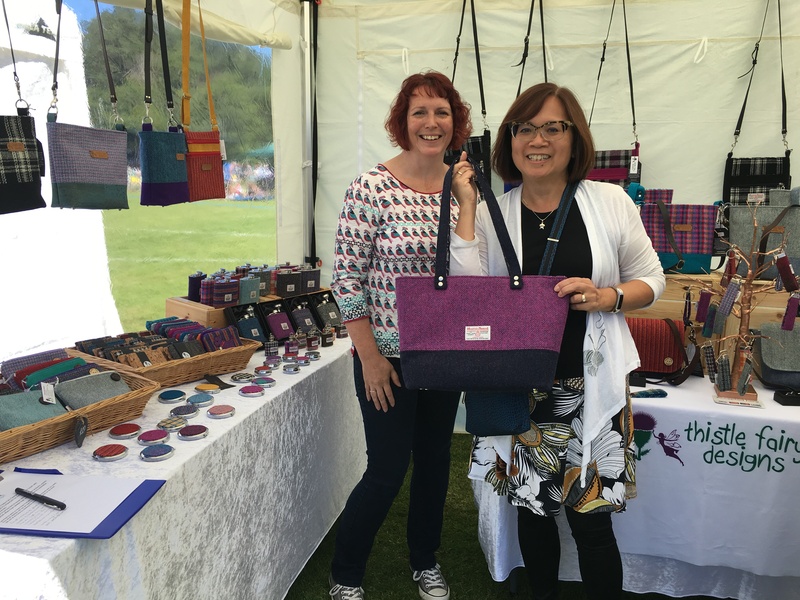 This entry was posted in travel, yarn and tagged harris tweed, highland games, lorne highland games, Scotland, Wool waulking. Bookmark the permalink. Love puffins! What great captures! Your trip looks amazing and your new bag is beautiful. Love the new knitting bag! 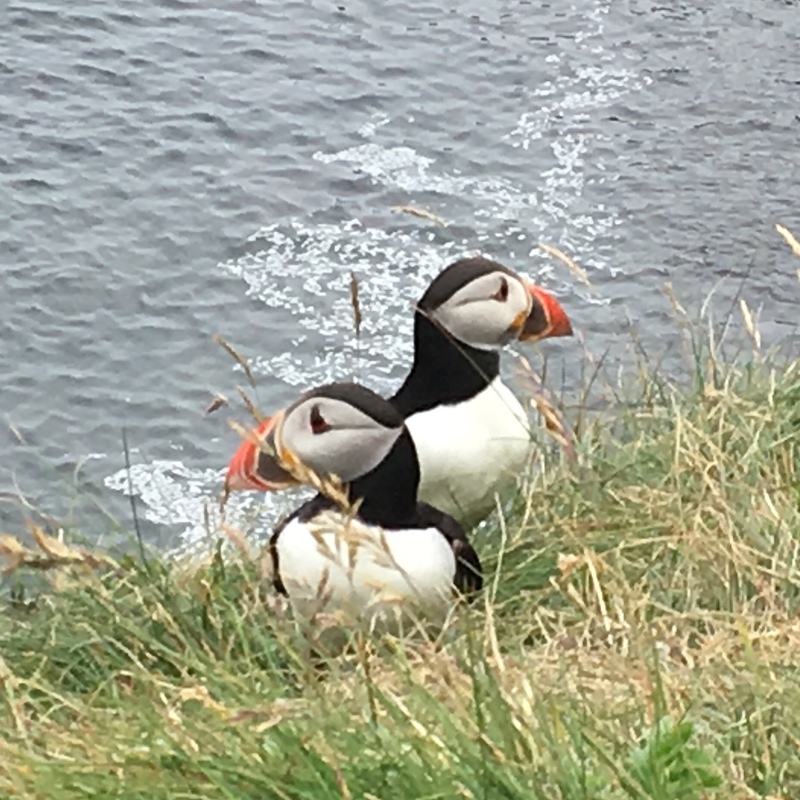 Your trip sounds so great, and those puffins!! 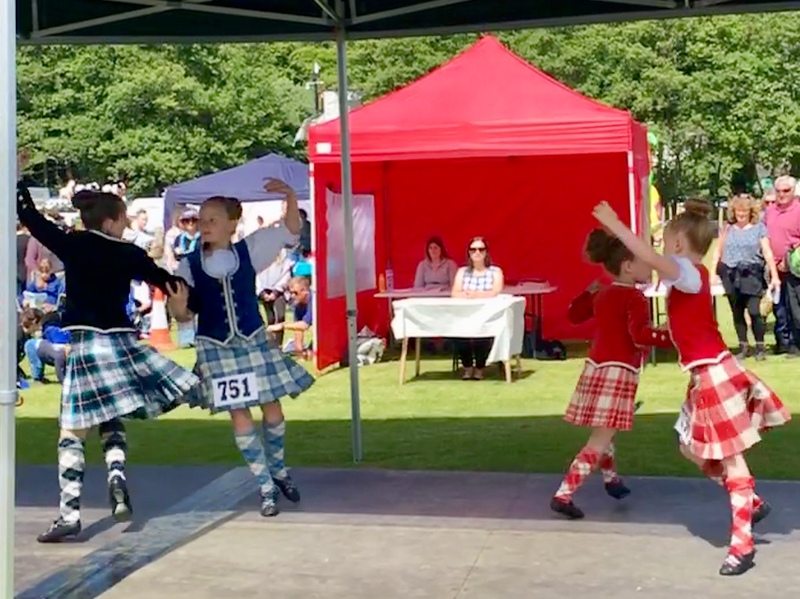 The Portland Highland Games will be held at Mt. Hood Community College on July 21, if you want to see a caber or two tossed around. I used to love going to them when I lived in Portland. Sounds like a great trip! Great new bag! I like the aqua color, but actually with the Dove. Thatâs an interesting combo, but I already own the blue! Oh, well. It will all be lovely, eventually. The ideas are coming faster than I can knit and write them. Knit on! If you ever want to try out the biggest Games in North America (and I think outside of Scotland in general), come visit Eastern Ontario on the first weekend of some August. The Glengarry Games in Maxville have all the usual stuff (but *lots* of it — the closing massed bands featuring thousands of musicians is an experience not to be missed), plus fiddling, if you’re into that, and tug-of-wars (tugs-of war?). I haven’t been in a few years, but they are always a highlight of my summer when I do make it out. Oooh, massed pipe bands! That would be so cool. And caber toss, of course. Someday! Sounds like a great trip! What is the purpose of waulking the tweed, what finishing does it provide? It seems like it would be a bit like felting – drawing the fibers closer. Yes, it fulls/felts the fabric, and softens it a bit, too. It’s beautiful!